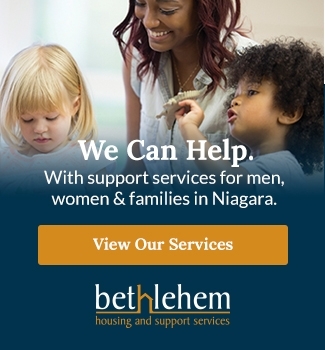 We are so grateful for the opportunity to acknowledge the impact Bethlehem Housing and Support Services has had in the life of our son, and therefore our whole family. In fact, as a family we were desperate to help our child who was struggling in absolutely every area of his life. He is intelligent, articulate, kind and compassionate, yet sometimes even the activities of daily living baffled him. He was determined to have a job, but was unable to learn tasks quickly enough and lost positions. He was troubled by mental health issues and Tourette’s syndrome. Yet in spite of this, he always remained determined and hopeful. Our journey with Bethlehem started well more than a decade ago. I had heard that there was some opposition to their proposed project in Niagara Falls, and so I joined a group of vocal supporters striving to influence decision-makers at City Hall. They heard our pleas on behalf of those not able to speak for themselves and thankfully it was all uphill from there. Our son moved into Kenmore Court the very first day the doors opened. You would think that the substantially improved standard of living would be the highlight of the story, after all, he did move from a wet and dark basement apartment into a bright brand new main floor home. But the physical situation really did pale in comparison to the effect of having onsite community support workers. These workers provided him with personalized support when he needed it most and in his darkest days. They referred him to other community resources, they advocated for him when he was not able to do so for himself, and connected him to additional services in the community. They were listening ears and trusted guiding hands. Additionally, he became part of a neighbourhood right at Kenmore Court. He made friends, he became a tireless helper to folks in the building who needed assistance, and he frequently was the ‘go to guy’ when someone needed help, extra muscles, or someone who could just reach really high. He was given the opportunity to experience success in a work role by shoveling and managing the snow and ice over the winters. Kenmore Court, its staff, other residents and Bethlehem’s programming were all critical pieces to our son becoming strong, growing his self-confidence, learning social skills, and ultimately becoming fully independent and successful. His new boss posted on the bulletin board at work to announce his promotion several months ago: “It is with great pleasure that I announce Frazer Kon as our new Lead Steward. Frazer has been with us for the last 10 months and has shown natural leadership in the Stewarding Department. I firmly believe Frazer is the right person for this job and I hope everyone will support him in taking on this roll. So, everyone, please join me congratulating Frazer on his new position!” Needless to say, we are extremely proud of Frazer for overcoming and for becoming. Along the way, we appreciate the many helpers our family has encountered. We count Bethlehem at the top of that list. We know how critical your work is to the community and now you know how critical your work has been to our family.